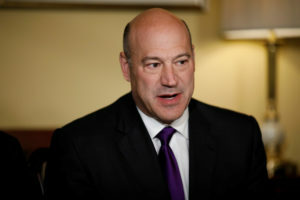 WASHINGTON — Top economic adviser Gary Cohn is leaving the White House after breaking with President Donald Trump on trade policy, the latest in a string of high-level departures from the West Wing. Cohn, the director of the National Economic Council, has been the leading internal opponent to Trump’s planned tariffs on imports of steel and aluminum, working to orchestrate an eleventh-hour effort in recent days to get Trump to reverse course. But Trump resisted those efforts, and reiterated Tuesday he will be imposing tariffs in the coming days. Cohn’s departure comes amid a period of unparalleled tumult in the Trump administration, and aides worry that more staffers may soon head for the doors. It’s the latest in a string of high-level departures from the West Wing. The announcement came hours after Trump denied there was chaos in the White House. Trump maintained that his White House has “tremendous energy,” but multiple White House officials said Trump has been urging anxious aides to stay. Cohn is a former Goldman Sachs executive who joined the White House after departing the Wall Street firm with a $285 million payout. He played a pivotal role in helping Trump enact a sweeping tax overhaul, coordinating with members of Congress. Cohn nearly departed the administration last summer after he was upset by the president’s comments about the racial violence in Charlottesville, Va. Cohn, who is Jewish, wrote a letter of resignation but never submitted it. 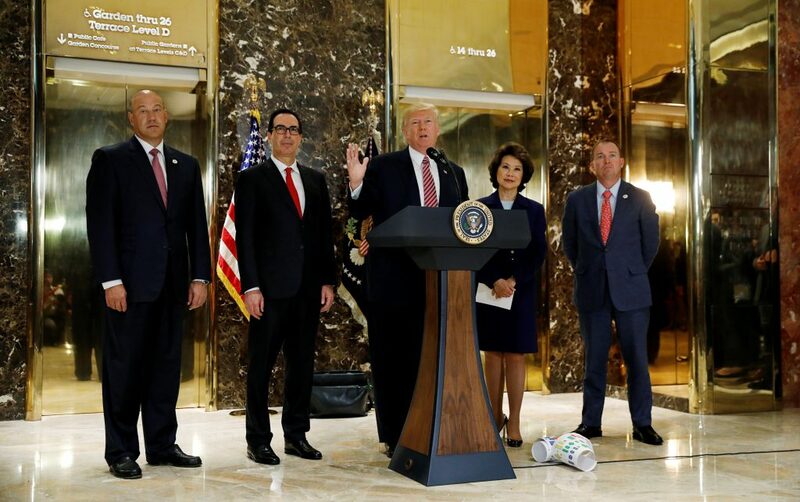 U.S. President Donald Trump is flanked by members of his administration, including Director of the National Economic Council Gary Cohn, far left, as he speaks in August about the violence, injuries and deaths at the “Unite the Right” rally in Charlottesville from the lobby of Trump Tower in Manhattan, New York. REUTERS/Kevin Lamarque. Trump acknowledged he is a tough boss to work for, saying he enjoys watching his closest aides fight over policy. “I like conflict,” he said during the press conference. Cohn was nowhere in sight at the press conference and a seat reserved for him in the East Room was filled by a different aide. Dating back to the campaign, Trump has frequently and loudly complained about the quality of his staff, eager to fault his aides for any mishaps rather than acknowledge any personal responsibility. But the attacks on his own staff have sharpened in recent weeks, and he has suggested to confidants that he has few people at his side he can count on, according to two people familiar with his thinking but not authorized to publicly discuss private conversations. Coinciding with the heated debate over tariffs, Trump’s communications director Hope Hicks, one of his closest and most devoted aides, announced her resignation last week, leaving a glaring vacancy in the informal cadre of Trump loyalists in the White House. Turnover after just over a year in office is nothing new, but the Trump administration has churned through staff at a dizzying pace since taking office last January, and allies are worried the situation could descend into a free-fall. Cohn nearly departed the administration last summer after he was upset by the president’s comments about the racial violence in Charlottesville, Va.
Making matters worse, the list of prospects to replace departing aides grows shorter as the sense of turmoil increases. Vacancies abound throughout the West Wing and the administration at large, from critical roles like staff secretary to more junior positions in the press office. Multiple aides who are considering departing said they didn’t have a clue who could fill their roles — adding that their desire to remain team players has kept them on the job longer than they had planned. But they warned they were nearing their breaking point. A number of aides have expressed worry about the legal implications — and steep legal bills — they could face if ensnared in the ongoing Russia probe. The probe has had a chilling effect on an already sluggish White House hiring process, according to officials, and there is wide concern that working for Trump could negatively affect future career prospects. Meanwhile, the prospects for significant governing achievements in the coming years — like the GOP tax bill passed in December — are growing fleeting, as Republicans face a daunting electoral environment this fall. AP writers Darlene Superville, Jill Colvin, and Ken Thomas contributed to this story.